PURE AMINO ACIDS! Earths Design No2 is a potent blend of L-Arginine, L-Citrulline, L-Citrulline Malate and Beta Alanine. HIGH STRENGTH! 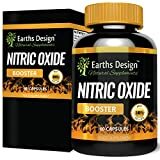 Earths Design Nitric Acid has 1280mg of the aminos L-Arginine, L-Citrulline, L-Citrulline Malate and Beta Alanine packed into each and every capsule. PREMIUM QUALITY! Earths Design NO2 is made in the UK under GMP certified facilities. It’s made to the highest standards of hygiene unlike other imported brands.